In the litigious society we live in, many documents need to be notarized for validation. Notarizing a document simply entails signing the document in front of a notary public. The notary public is an officer of the court, meaning they can witness the signing of documents. There are many types of notary services and they can differ from state to state. Florida notaries can perform marriage ceremonies, but here in New York, where I’m at, a notary cannot perform these marriage services. When signing before a notary public, you have to prove you are the person you say you are and the person named in the document. The most common method is producing a state issued photo identification, i.e. a drivers license. Most people have problems with the identification because they feel any identification is valid. First, the ID cannot be expired, an EXPIRED identification is not valid. Second, the ID has to be issued by a government agency, i.e. driver’s license, state identification, state benefit card with picture and signature, to name a few. Certain situations will arise where the person has no valid identification. In many instances, you can use a witness, or two, that will confirm the individual’s identity. Special situations call for different approaches when dealing with a tricky notary. In immigration matters, a child may be needed to submit an affidavit for a family member, and it has to be notarized. How do you notarize when a child has no government issued ID? Not all kids have passports, so this kind of notary must be handled differently. Personally, I ask one of the child’s parent to be present with their valid ID and the child’s birth certificate. Immigration applications have increased and the need to notarize these kind of documents has also been on the rise. Make sure you ask what is needed and be ready to provide what was requested from you. There are no set rules on how to do these types of notaries, make sure you ask what the notary requires or the service. Hospital notarizations are tricky and not done by all notaries. Many hospital notaries are emergency situations where the signer can be really sick, possibly terminal, and/or having surgery. Others are just in that setting and must handle matters during their stay. When dealing with sick people, who are possibly medicated, you must first see the person and how they interact with others around them. Listen to the details they use in their speech, their level of lucidity, and other body language cues that can be used to measure the person’s level of competence. Pay attention to the people present, who might have an interest in what is about to be notarize. Are they trying to fleece the signer or take advantage of the person and their property? Individuals in hospitals are usually in a vulnerable state and can be easily manipulated. As a notary, you must learn to detect the signs of abuse, neglect and/or manipulation, especially when Powers of Attorney are involved. Listen to how the family interacts with each other and with the signer. Be prepared to stay for at least 1/2 while you gauge the situation. Rules and laws governing notaries differ greatly across the country. Make sure you check with your state on the costs, since prices vary and some notary publics like to take advantage and charge more than the state allows. In New York State, a notary can only charge $2.00 per notarized signature. I’ve seen notaries charge up to $10.00, although this is allowed in other states, like California, it is not allowed in New York. 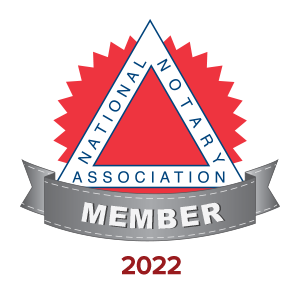 Notaries can offer a wide range of services, not just the notarization of documents. Many notaries offer mobile services, apostille services (American paperwork that is going to be used in a foreign country), among other services. Talk to your local notary before you seek services elsewhere. Chances are, they can offer the service you need, and usually are properly trained to offer the service. Credit repair companies are looked upon with a skeptical eye as many have been led to believe that credit repair is illegal and only time can repair your credit. This is not true and the Fair Credit Reporting Act gives you the right to challenge incorrect information in your credit reports. Why wouldn’t you challenge information in your credit reports that are reflecting negatively on your credit worthiness. There are many credit repair companies out there, but not all provide the same level of service. Not too long ago, someone reached out to me with questions about credit repair. I was shocked to find out that he had signed up with a large, and very well-known repair company, over a month had passed yet he had not heard a thing from them. Our turnaround time is less than a week, and we get started immediately on your analysis and disputes. The credit repair process takes time when done legally; hence, the faster you begin the process, the quicker the results. Also, credit repair is not only disputing negative items in your credit reports, establishing good credit at the same time is essential for the process to work. Knowing when and how to establish new and good credit history is something Martinez Consulting Services teaches, as well as other credit habits that should be implemented in order to achieve financial goals and independence. Learning how to use credit correctly will help raise your scores and credit worthiness in the eyes of creditors and lenders, placing you in a position where you can purchase your dream home, dream car, send your kids to the college of their choice or take that dream vacation without leaving you destitute. The possibilities are endless if you take control of your credit and finances today. To request information or to get started, please send your contact information with preferred method and time of contact to Lmartinez964@optimum.net. Better insurance rates, whether life, auto, etc. Martinez Consulting Services will help repair your credit and teach you the necessary tools to help you achieve your credit goals, whether it’s to be debt free, buy a house, buy a car or take that dream vacation. The possibilities are endless if you take control of your credit and finances today. To request information or to get started, please send your contact information with preferred method and time of contact to Lmartinez964@optimum.net.